U.S.-based automaker startup Rivian made headlines when it revealed its electric pickup truck back in November. But it’s about to face some storied competition from iconic Ford trucks including the classic F-150. Ford revealed today it that will release all-electric and hybrid versions of its best-selling F-series and Super Duty pickup truck lineup. Ford president Jim Farley told analysts in Detroit that the move was intended to “future-proof that global juggernaut of commercial vehicles,” according to The Detroit News. 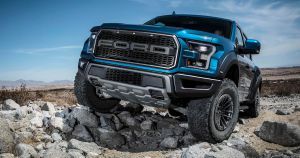 And that’s a pretty big deal: for decades, Ford’s F-Series have been some of the best-selling pickup trucks in the United States. Ford sold almost 900,000 F-Series trucks in 2017 alone. It’s part of Ford’s greater move to electrify its fleet — according to Reuters, it’s planning to spend $11 billion by 2022 on EV investments and add 40 hybrid and electric vehicles to its lineup. The company also announced it will partner with German automaker VW to release future EVs, and other autonomous vehicles yesterday. It may have massive reach in the auto industry, but Ford isn’t alone in wanting to release an electric truck. For one, there’s Elon Musk’s passion project: Tesla’s “straight out of Blade Runner” pickup truck. We have yet to see any final designs or a release timeline for it, but if Musk has his way, its specs will be groundbreaking. But then again, Ford doesn’t know when their battery-powered F-150 will hit the road either — officials didn’t offer a timeline today. The hybrid version, though, will launch in 2020. What will people who decide to “ICE” — or block — electric car charging ports think, now that even the most mainstream of trucks is going electric? They’ll have to decide that for themselves — maybe they’ll be taking advantage of those chargers themselves in the future.